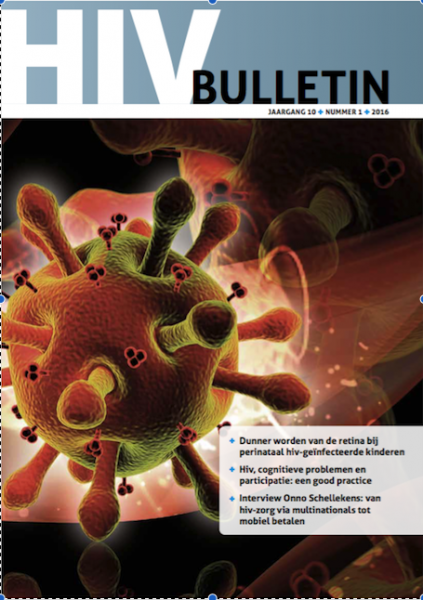 Artikel over het onderzoek van Kai Jonas en mijzelf naar HIV stigma op de werkvloer. MooI! Klik hier om het te lezen! 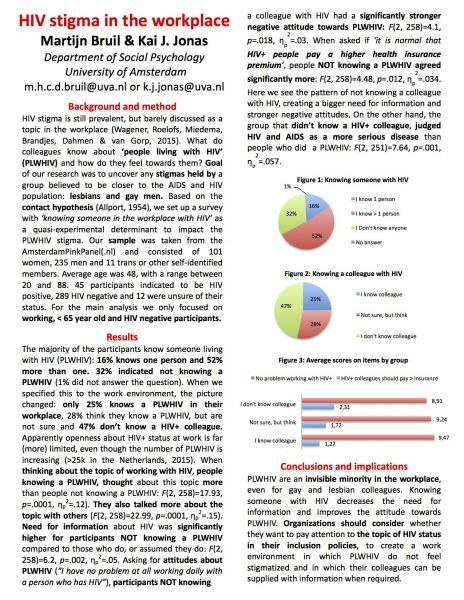 A couple of weeks ago, Dr. Kai Jonas and myself (Martijn Bruil) made a number of national newspapers with a small study we did on HIV stigma. It was related to the AIDS Impact conference held end of July in Amsterdam. During the conference all scientist doing research on the impact of HIV prevention, infection, AIDS, treatment, etc, join to share the status around the world. While in Western European countries, HIV and AIDS might seem a small problem that very little people suffer from, worldwide the epidemic is still growing, also in new regions like Eastern Europe and Asia. So research on HIV/ AIDS is still very relevant! In the Netherlands, it is estimated that around 25.000 people are HIV infected, of which around 19.000 know and are treated (and 6.000 people do not know, because they don’t get tested). The ones that have HIV but do not test for HIV, create the biggest risk for spreading the infection. Around 1.100 new HIV+ diagnoses are done yearly. So it’s very important to get tested regularly if you are part of a risk group! Around 50 people a year still die of AIDS in the Netherlands. That does not sound like a lot, but is still 50 too many. We wanted to know how ‘big’ the issue of HIV stigma is in the Netherlands. Since people living with HIV are being treated now with medicine cocktails, their health and quality of life has improved tremendously. And a lot of people with HIV can live their life pretty normal and work as well! How normal is it however to be a person with HIV working in a company? What do you colleagues feel and know about that? We wanted to find out by asking our Amsterdam Pink Panel about their experiences with colleagues living with HIV. The results were interesting to say the least. A small summary is outlined below: I cut out all the statistical information not relevant for general readers but the poster we presented at the conference can be found on my website (click here). Goal of our research was to uncover any stigmas held by a group believed to be closer to the AIDS and HIV population: lesbians and gay men. Based on the contact hypothesis (Allport, 1954), we set up a survey. Our sample was taken from the AmsterdamPinkPanel(.nl) and consisted of 101 women, 235 men and 11 trans or other self-identified members. Average age was 48, with a range between 20 and 88. 45 participants indicated to be HIV positive, 289 HIV negative and 12 were unsure of their status. For the analysis we only focused on working, < 65 year old and HIV negative participants. The majority of the participants know someone living with HIV: 16% knows one person and 52% more than one. 32% indicated not knowing a person living with HIV (1% did not answer the question). When we specified this to the work environment, the picture changed: only 25% knows a person living with HIV in their workplace, 28% think they know a person living with HIV, but are not sure and 47% don’t know a HIV+ colleague. Apparently openness about HIV+ status at work is far (more) limited, even though the number of people living with HIV is increasing. We also asked people how much people they thought were living with HIV in the Netherlands and how many people in the Netherlands still die from AIDS per year. When thinking about the topic of working with HIV, people knowing a HIV+ person, thought about this topic more than people not knowing a person living with HIV. If you know someone who is HIV+, you also talked more about the topic with others. Need for information about HIV was significantly higher for participants NOT knowing a person living with HIV compared to those who do, or assumed they do. Asking for attitudes about people living with HIV (“I have no problem at all working daily with a person who has HIV”), participants NOT knowing a colleague with HIV had a significantly stronger negative attitude towards HIV+ colleagues. When asked if ‘it is normal that HIV+ people pay a higher health insurance premium’, people NOT knowing a PLWHIV agreed significantly more. Here we see the pattern of not knowing a colleague with HIV, creating a bigger need for information and stronger negative attitudes. On the other hand, the group that didn’t know a HIV+ colleague, judged HIV and AIDS as a more serious disease than people who did know a person living with HIV. What does this all mean? What do we want from this? This is also what the journalist asked us. For one, it means that people living with HIV are an invisible minority in the workplace, even for gay and lesbian colleagues. For people who are HIV+ this might lead to feeling less secure and free in the workplace. Maybe not sure to tell other people or not or unsure about the reaction of the management and company. On the side of the colleagues it means knowing someone with HIV decreases the need for information and improves the attitude towards people living with HIV. 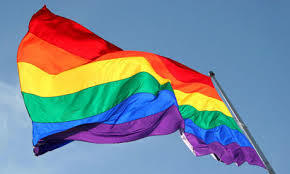 Organizations should consider whether they want to pay attention to the topic of HIV status in their inclusion policies, to create a work environment in which people living with HIV do not feel stigmatized and in which their colleagues can be supplied with information when required. More research is needed and that is exactly what we hope to do in the near future to determine – together with working HIV+ people and organisations – what needs to be done to limit the negative effects of stigma. For now – having these articles in the newspaper already made more people aware of the issue and hopefully opened up some doors (or small windows?) to talk about this topic. Het AmsterdamPinkPanel is een samenwerking tussen het COC Amsterdam en het Onderzoeksinstituut Psychologie van de Universiteit van Amsterdam, waar ik ook mijn promotieonderzoek doe. Het doel van het panel is om de LHBT-(lesbisch-homo-biseksueel-transgender)gemeenschap een stem te geven en om onafhankelijk van andere onderzoeksinstellingen te zijn. We willen met dit panel wetenschappelijk gefundeerd meningen en data over LHBT-relevante thema’s verzamelen, die een belangrijke bron van informatie kunnen vormen voor het COC Amsterdam en de wetenschap. Daarnaast kan deze informatie het werk van COC Amsterdam verbeteren en/of ondersteunen. Wil jij je inschrijven voor het AmsterdamPinkPanel - ga dan naar de site www.amsterdampinkpanel.nl.